watchOS 3: Why does Minnie get more outfits than Mickey? Apple may have engaged in a shocking act of mouse sexism by giving the Minnie Mouse watch face many more color options than the Mickey Mouse watch face. watchOS 3 has many fine new features, but one of the most long awaited changes is the addition of a Minnie Mouse watch face. Mickey Mouse has had his own watch face since the very beginning of the Apple Watch, and it only seems right for Minnie to get her day in the sun. But Apple may have overcompensated when it added the Minnie Mouse watch face. The company has offered a huge range of color options for Minnie Mouse, thus giving her many different outfits to choose from in her watch face. 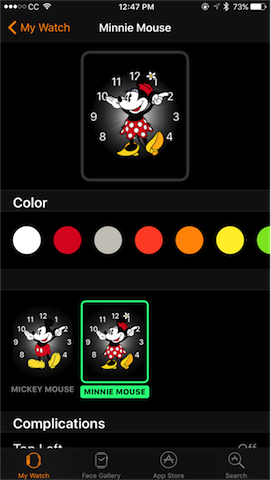 You can access all the different color options by opening the Apple Watch app on your iPhone, then tapping on the Minnie Mouse or Mickey Mouse watch face. So Minnie Mouse has seventeen different outfits she can wear in her watch face! Not bad for a first time appearance on the Apple Watch, most Minnie Mouse fans should be quite pleased with her range of outfits. Yup, that’s it folks. 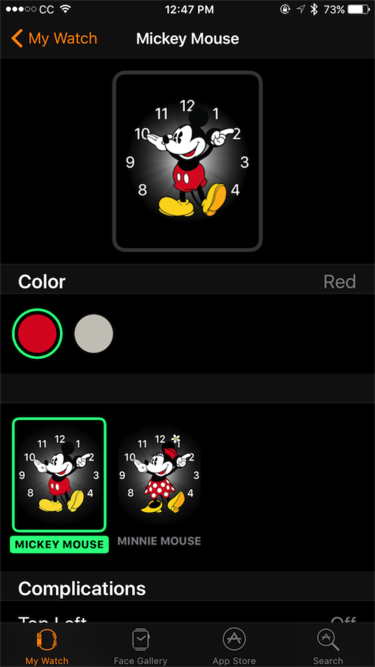 If you prefer Mickey as your watch face, you only have two options to choose from to customize how Mickey looks on your Apple Watch. Poor Mickey, despite being an original Apple Watch star, he seems to have become a second rate watch face for Apple. Did Apple discriminate against both sexes with its watch faces? 1. Apple was trying to compensate for not including Minnie Mouse in previous versions of watchOS. So it went overboard in providing customization options for the Minnie Mouse watch face. 2. Apple is being misogynist by believing that women and girls (who are probably far more likely than men to choose the Minnie watch face) need to constantly change Minnie’s outfit. 3. Apple is being misandrist by believing that men (who are probably more likely to use Mickey’s watch face) wouldn’t want to change Mickey’s appearance once in a while on their Apple Watches. Or perhaps it’s just a diabolical combination of everything above? Apple may have achieved something quite remarkable by simultaneously stereotyping the behaviors of both sexes. Wow, you have to give Apple credit, not many companies have been able to achieve that with their software! I really don’t know why Apple made these choices but it might be a good idea for Apple’s PR department to weigh in with an explanation, lest the company be accused of sexism by certain political factions in our society that tend to war about these sorts of...er...very important issues. Obviously I’m kidding about Apple being misogynist or misandrist because of the color options it offers in watchOS 3 for Mickey and Minnie. And I really hope there aren’t folks out there who would take such things seriously, after all we’re just talking about watch faces here. Lighten up, folks! But, as a fan of Mickey, I do hope that Apple will eventually add the same color options for Mickey that it is currently offering for Minnie. This would be a true example of…er…equality between the mouse sexes, and would set a good example for other companies and the rest of society. After all, do we want our kids to grow up thinking that male mice only wear two different outfits but female mice choose from seventeen different ones? Talk about blatant sexism! In the meantime, Mickey fans will just have to get by with Red or Classic.